Jane wanted to go to Rocky Mountain National Park on her last day before hip surgery. She also wanted to meet her ex-boss at Public Service Credit Union since he lived in Ft. Collins, and Estes Park would be somewhat of a midpoint. 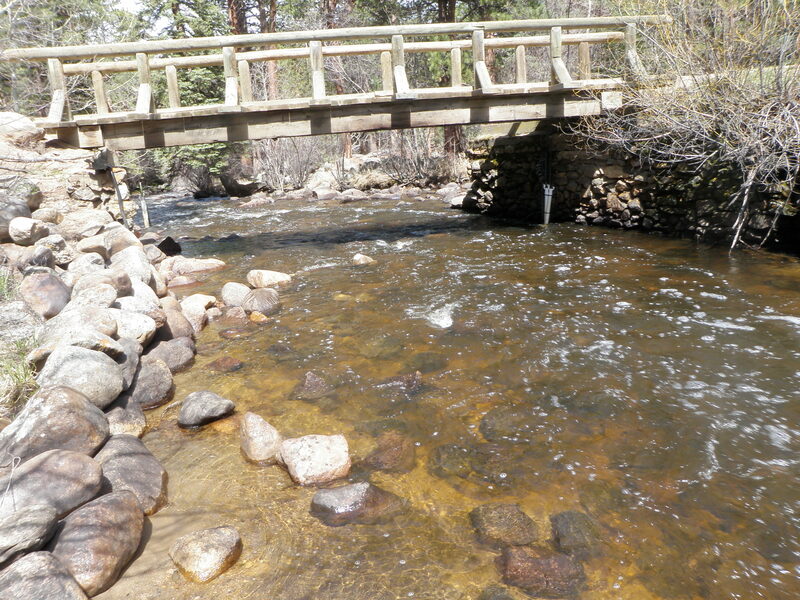 I checked the flows, and they were 129cfs below Estes Lake, which is pretty high for that streambed. 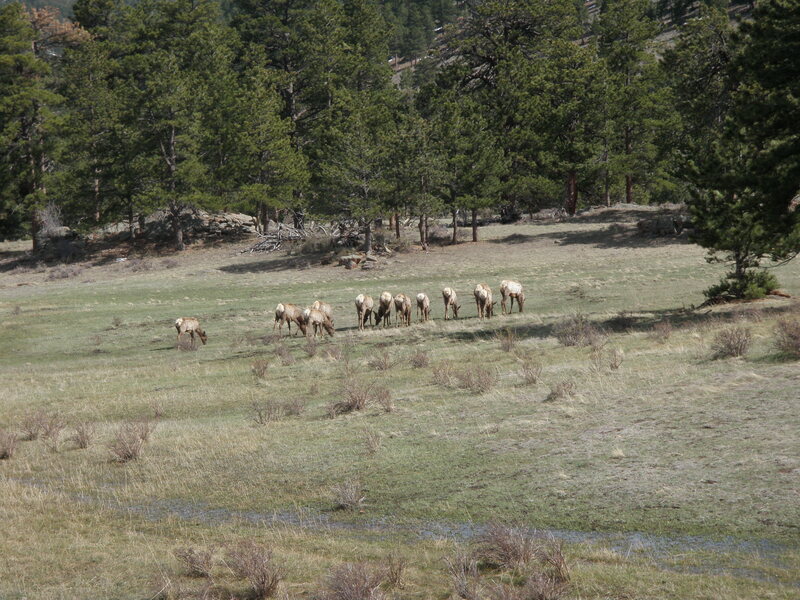 The flows in the Big Thompson above Lake Estes near Moraine Park, however, were 35 cfs. We met Steve for lunch at the Big Horn Restaurant on the edge of Estes Park. Steve and Jane then dropped me off at Moraine Park, and they continued to Sprague Lake. I hiked down along the river and underneath the road to near a cabin at the edge of RMNP. At this point I discovered I’d forgotten my front pack containing my nymphs, hemostats, nippers, tippet, prime flies, split shot and strike indicators. Jane had taken the car, so I debated hiking back up to the road and hitching a ride to Sprague Lake or trying to make do with what I had in my backpack. I had three fly boxes containing all dry flies and a couple spools of old 6X tippet. I elected to make a go of it. I tied on some tippet then an olive body palmered caddis that could have been a stimulator. I began prospecting with this fly and much to my amazement, landed a small brown. I continued working upstream, but wasn’t getting any more looks and the fly was sinking so I switched to a Chernobyl ant. 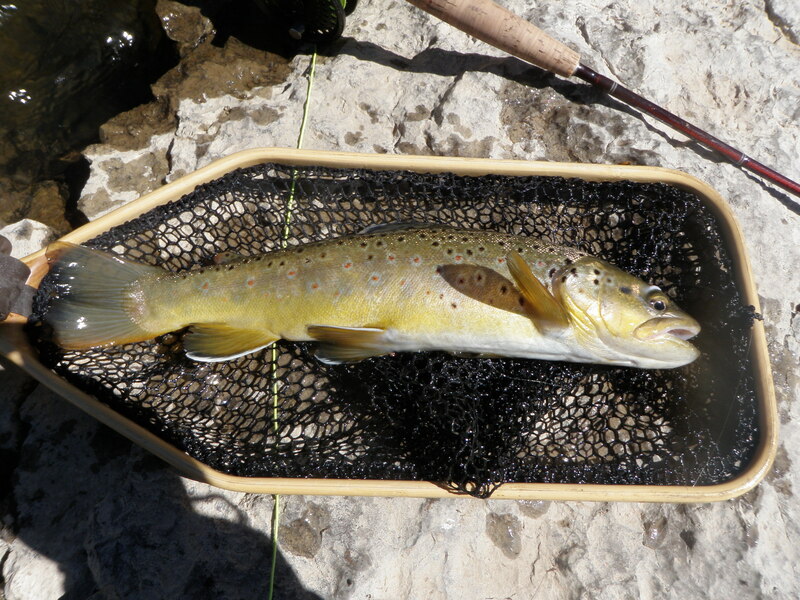 In the next two hours I landed four additional small brown trout in the 9 inch range on the Chernobyl ant. All the fish were caught along the edge in fairly slow moving water. The deep runs and pockets in the middle of the stream cried for a beadhead dropper, but my lack of preparation precluded this option. 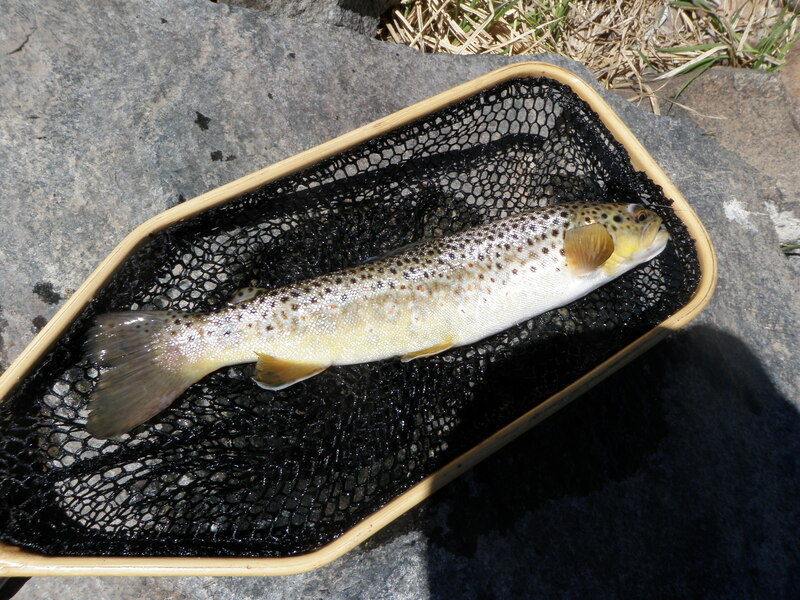 The online fishing reports stated that the Arkansas River remained low and clear with decent BWO hatches on cloudy days and some spurts of caddis hatching activity. 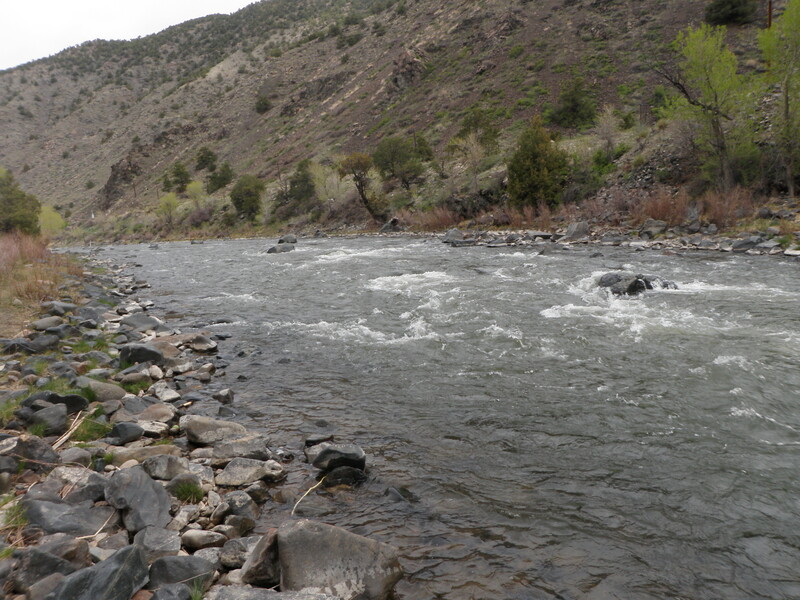 To be able to fish on May 14 in Colorado in clear rivers is bonus time. I decided to make the trek to the Salida area. The one foreboding piece of information was the threat of heavy afternoon showers similar to that experienced the last three days. As I drove the US285 route and ascended to Aspen Park I noticed approximately three inches of fresh snow on the hillsides. This continued all the way until half way across South Park where it diminished to an inch or less, and by the time I descended to the Arkansas River drainage, there was no snow on the ground. When I crossed the river for the first time below Buena Vista the river was indeed low and clear. The sky on the other hand was gray with high cloud cover. Occasionally specks of blue appeared, but it was very overcast. Would this promote good fishing or simply keep air and water temperatures too low? I planned to park at the same location as I’d used on my previous trip and fish upriver from where I’d ended. But when I made the U turn on US50, another fisherman was stringing his rod and preparing to fish. I drove back toward Salida and stopped at the next pullout. Since I hoped to eat lunch at noon, I decided to not cross the river and fish up along the roadside bank. I began with a nymph set up…prince on top and bright green caddis pupa on the bottom. I wasn’t seeing many caddis flitting about, but figured they were so plentiful that fish would still grab them. This strategy however proved to be fruitless. After covering some juicy water with no action, I tied on a yellow Letort hopper and trailed a beadhead prince. Again there was no action. Next I tried a caddis dry fly. This brought two refusals and a momentary hookup, but it wasn’t producing the way I expected. Next I arrived at a nice deep eddy that fanned out into a nice deep run and spotted several rises. I looked closely at the water and spotted some small BWO’s riding the current like tiny sailboats. I switched to a CDC BWO and covered the fish in the eddy for around 15 minutes, but could not entice any action. It was now around noon, and I was at a decision point. Should I break for lunch and possibly miss a BWO hatch or continue fishing? I had left my Camelback in the car anticipating a return in 1.5 hours. I chose to return to the car. As usual I ate my lunch overlooking the river and spotted numerous rises on the far side from the eddy I’d been fishing. After finishing lunch I retrieved my rod and fishing gear and returned to where I ate and surveyed the river for a crossing point. The current appeared to be too swift directly across from my position, but there was a deep slow pool that fanned out to a wider tail upstream a bit. I walked up along the bank for 70 yards and began my crossing. When I was 2/3 of the way across, the river was covering the bottom of my front pack, and I realized I wasn’t going to make it. I did a 180 and had a few steps where only my tip toes were touching due to my increased buoyancy and the depth of the river. I had to thrust my right arm below the surface of the river nearly up to my elbow in order for my short handmade wading staff to touch bottom. Having evaded this wading danger, I returned to shore and decided to drive back down to the Fremont-Chafee pullout and cross at the tail of that pool. I had done this several times during my previous visit and I really wanted to get to the rising fish across from where I ate lunch! The fisherman who I’d seen earlier had now departed, so I had the entire pullout to myself. Despite my fleece cardigan, I was still feeling chilled as the wind blew from the east and the sky darkened, so I put on my new Columbia raincoat that Jane gave me for Christmas. This would prove to be a crucial positive move. I waded across the tail of the long pool without incident and hiked the railroad tracks on the north bank for two football fields until I came to the area I targeted. In the short time after I left my spot, a pickup truck had arrived and two fishermen were rigging up to fish. When I got close to the water I observed and noticed BWO’s on the surface but also some caddis. I decided the fish were going for the BWO’s and kept my CDC BWO on the line and began casting. It was quite difficult to see the tiny fly and the wind had picked up and threw off my accuracy. Windblown casts and not being able to spot your fly are difficult to overcome. Meanwhile the two fishermen arrived across from me, and the taller of the two caught a trout on the first cast. I’d been fishing for almost two hours and had yet to land a fish. After perhaps 20 casts in the area of rising fish, I hooked and landed a chunky rainbow on a downstream drift. The rainbow grabbed the BWO just as it started to drag. After releasing the fish, I paused to dry my fly and observed the water. I could see emerging caddis skittering across the water and several of the rises looked like fish moved laterally, so I guessed that some of the fish were on to the caddis. I switched to a dark olive deer hair caddis and in short order landed a couple fish. I continued working the nice area and landed five trout in total. The productive area was around thirty yards long and 15 yards wide and consisted of three or four wide runs that fanned out beneath rocks that poked above the water. There were probably 20 fish rising in this area with average depth of 3-4 feet. I occasionally observed the fishermen across from me, and they weren’t catching fish. They were spending more time changing flies. I walked up along the bank to a point that I guessed was above where the raft had floated. It was now around 2PM and the sky darkened more and the wind picked up and it began to rain. I already had my raincoat on, so I simply pulled up the hood to cover my stocking cap. I looked down the river and the fishermen across the way had disappeared. I was just below a narrower fan run and spotted three separate rises. I cast the caddis to the lower fish first and then the upper plus a couple prospecting casts and land four trout from this small area! I continued working my way up along the bank. The fishable water was smaller here as the riverbed was narrow with swifter current not very far out from my position. 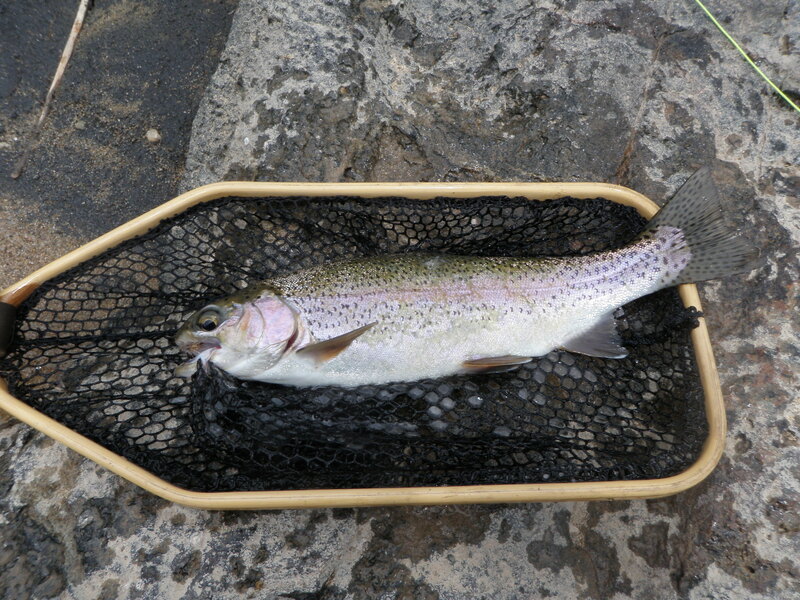 The rain picked up as I worked my way upstream along the bank and landed another four trout. The twelfth fish I landed was a beautiful chunky rainbow. I was facing downstream as I played, landed and released the fish and just as I turned around a raft drifted by (further out than the previous one), and the oarsman said “nice fish”. Finally at around 3PM I got to some nice looking water, and the rain was coming down harder than it had up until that time. But the hatch had died back, and I no longer saw steady risers working consistently. My hands were raw and chilled from the evaporating water, so I decided to make the long hike back to the car. I now had about 2.5 football field lengths to cover and another river crossing. As I hiked back, the two gentlemen on the opposite bank were still at it, wearing raincoats now. Apparently they missed some of the best fishing while they returned to the truck to get their rain gear. It was worth the wait. I’ve lived in Colorado for 20 years, and every year I visit the Arkansas River to attempt to hit the fabled caddis hatch. I’ve often seen the massive numbers of caddis after they already hatched, but only once have I hit the front edge of the hatch where the caddis are emerging and trout are rising to dry flies. Today was a second such experience. But I’m getting ahead of myself. 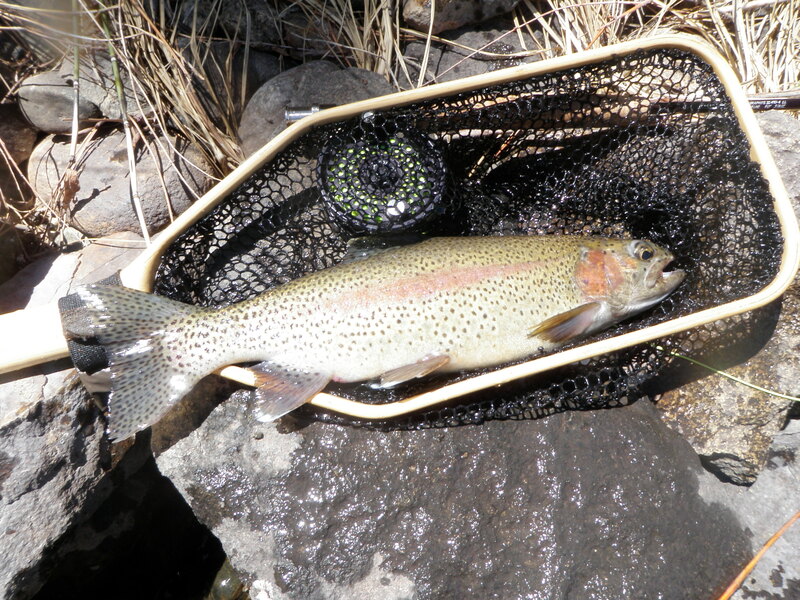 The online fishing reports said that the caddis hatch stalled near Texas Creek due to cool temperatures. 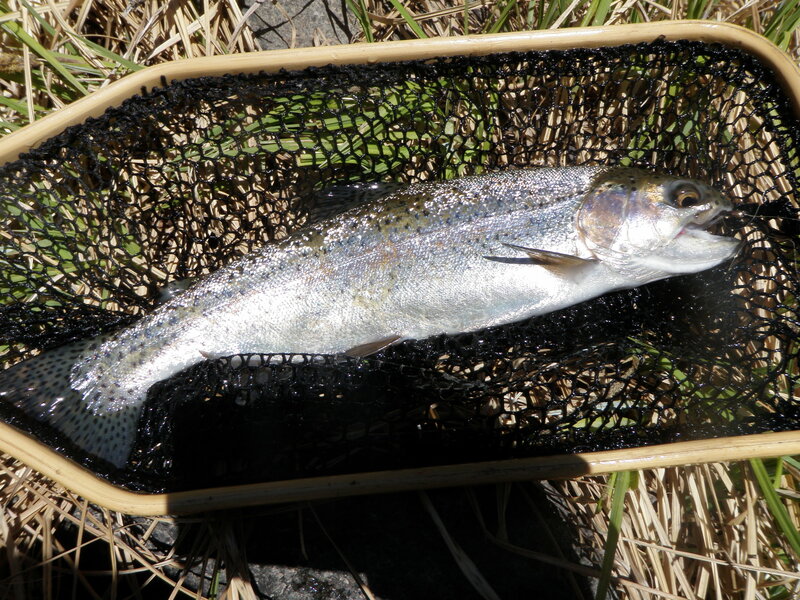 Arkanglers predicted that the warmer temperatures early this week would cause the hatch to advance, perhaps exploding all the way up the river at once. As near as I could tell they were right. 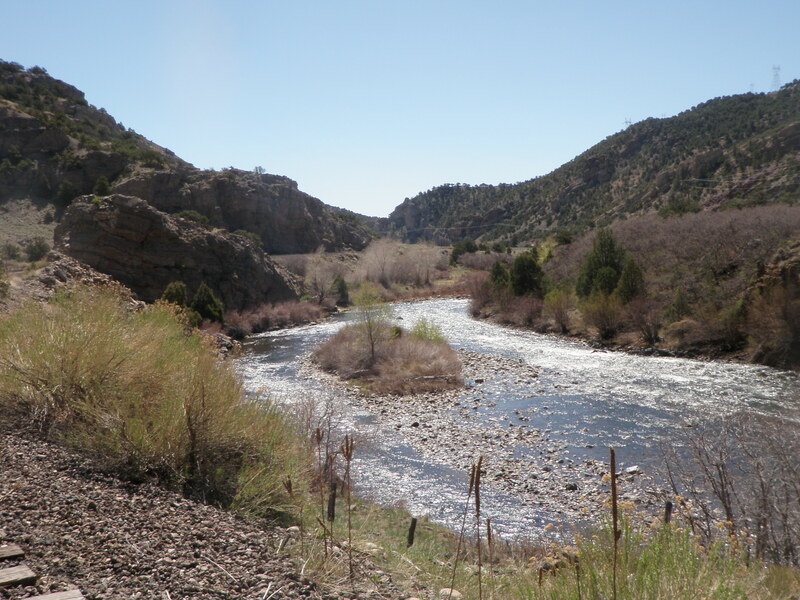 I left the house at 7AM and took the US285 route as I was interested in fishing below Salida. The strong gusts of wind pushed the van relentlessly as I drove through the Front Range and across South Park. How could I fish in this wind? I arrived at the pullout at the Fremont-Chafee County line and prepared to fish. 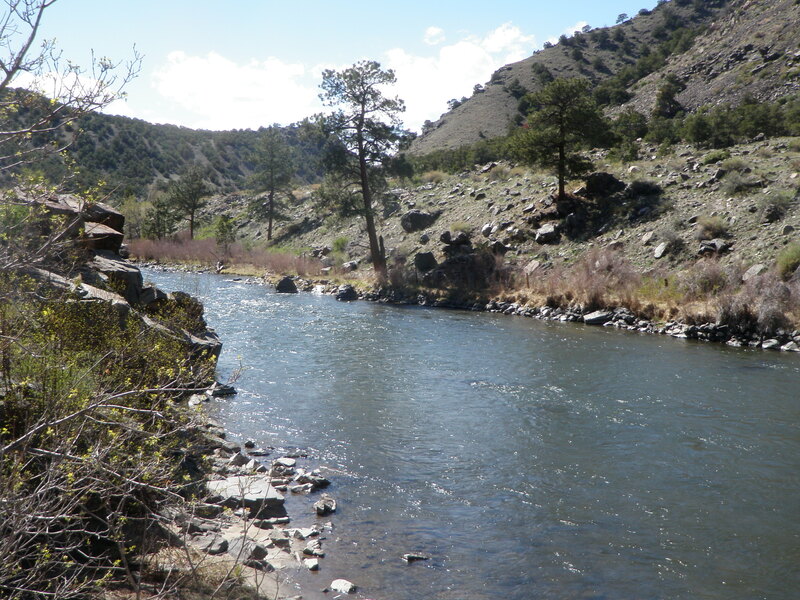 I went down the cement steps, and then crossed the river at the tail of the long pool across from the pullout. I hiked down the railroad tracks on the north side of the river to a point below the small island. I rigged up with a split shot, strike indicator, prince nymph and bright green caddis pupa and began swinging the flies through the riffles at 11AM. The wind was tough, but the weight and indicator helped punch the flies into the wind. I picked up two browns fairly quickly on the prince as the flies swung at the end of the drift. When I reached the bottom of the island, I removed the split shot and adjusted the indicator down to 3-4 feet above the top fly to fish the shallow right channel. I landed a couple small browns. When I nearly reached the top of the island, I returned to the bottom and worked up the left side of the island and landed a very nice brown. These trout were all grabbing the prince. At the top of the island I crossed over to the north bank and worked my way up the right side with the two nymphs. I picked up six more trout by prospecting the deeper pockets and runs close to the bank. 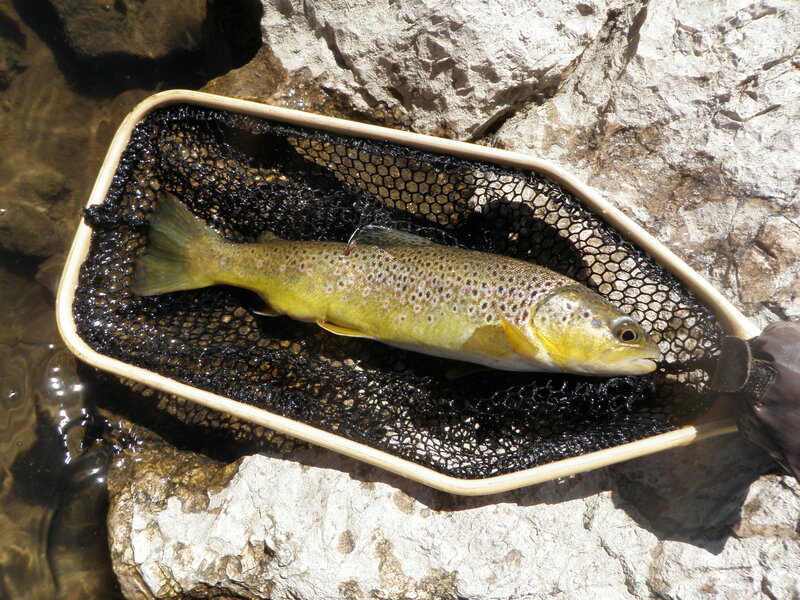 Two or three of the trout took the bright green caddis pupa and the remainder fell for the prince nymph. There was another fisherman on the south bank down the bank from my car, so I crossed the shallow tail and returned to the car for lunch. I grabbed my lunch bag and walked down to a rock high above the river and watched the water and the other fisherman. I ate my lunch around 1PM and as I finished eating, I noticed a pod of four or five fish rising along the north bank near a small rock that poked above the water a couple feet from the bank. I assumed the fisherman below me would move over and fish to the risers, but he continued struggling to punch casts into the wind below the high rock cliff where I was eating. After lunch I waded back across the river and headed for the aforementioned rock. The fisherman moved back near shore and pulled his line in and left! I maneuvered into casting position below the rock and noticed quite a few BWO’s on the surface. Of course the wind was gusting even stronger than in the late morning. Could I cast a dry fly upstream directly into the wind? I tied on CDC olive and got within eight feet of the lowest riser below the rock. I could see that the fish was decent. I failed to get a couple flies to where the fish was as the wind blew the tiny dry back near my feet. I totally overpowered several casts almost hitting my rod tip on the water and got some drifts over the fish. On the third or fourth such cast, the brown sipped in the BWO. 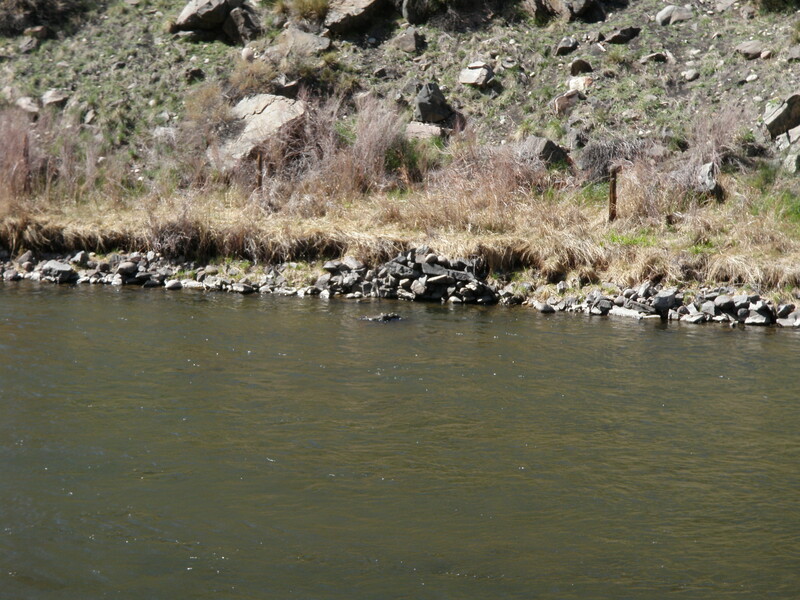 Next I moved a bit closer and cast upstream of the rock and two or three feet toward the middle of the river. Bam! Another brown sipped the BWO. It is difficult for me to describe what happened over the next two hours of the afternoon. All hell broke loose. I began seeing caddis tumbling and spinning on the surface as they tried to emerge in the gusting wind. The wind picked up flies and skittered them over the surface. There were BWO’s and caddis everywhere with the wind riffling the surface and blowing so hard that I could only cast between gusts. But fish were rising pretty regularly. I decided to switch to a dark olive deer hair caddis. This worked great, when I could get a cast upstream into the wind so it drifted over risers, I hooked fish. I worked my way up along the right bank spotting risers and landing beautiful fish in between waiting out the wind. Most of the six fish I caught between the last one on a BWO and the end of the day were nice size and three of them were chunky rainbows. At 3:30, the wind picked up even more. I could only cast sporadically and sometimes had to wait five minutes for the wind to subside before I could attempt a cast. I wasn’t seeing rising fish anymore despite the continuing presence of caddis, albeit not as dense as an hour earlier. I called it quits at 3:30 with 20 fish landed and a fantastic day.